One of India’s most successful amateur boxers, Vikas Krishan is all set to live his professional dream in the United States and claims to be in talks with Top Rank to join their roster. 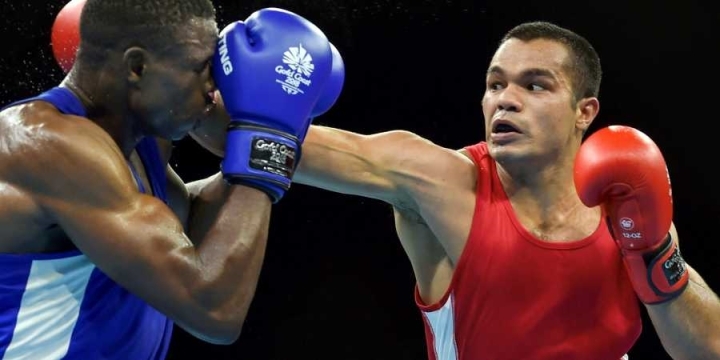 The middleweight (75kg) boxer, who won a gold medal at the Commonwealth Games earlier this year, will leave for the United States in December to fulfil his long-standing dream of turning pro. According to Vikas, he is set to sign a deal with Top Rank. “I have just returned from the US and I am all set to sign a deal with Top Rank Promotions which will look after my professional career,” he said on the sidelines of industry body FICCI’s 8th Global Sports Summit on Thursday. Vikas said once the deal is finalized, he will be based in New Jersey where his training will start in January next year. One of only four Indian male boxers with a world championships medal to his credit, Vikas said he will continue in the amateur circuit as well but only in major international events as he still wants to accomplish his goal of winning an Olympic medal. “It was a long-standing dream and it became reality after the world body (AIBA) allowed professional boxers to take part in the Olympics and Asian Games. The professional circuit will provide me with the best training and competitions,” he said. “All through the year I will ply my trade in professional circuit and return to amateur only six months before any major international event,” he added. The 26-year-old said he hopes to become a more fearless fighter after taking the professional plunge. “Now, it would be easier for me to compete against amateur boxers as I already will have the experience of facing professional heavyweights. This is will keep me in good stead. “I will be fearless in the amateur circuit now because in the professional circuit it is all about spilling the blood of your opponents or knocking them down,” he said. Krishan was at the center of controversy at the London 2012 Olympics. The Indian boxer was initially declared the winner over Errol Spence in their preliminary-round clash despite the Texas-based boxer dominating. Spence’s camp appealed on the grounds that the referee failed to spot Krishan committing a number of fouls, including spitting out his mouth-guard intentionally and repeatedly holding. Krishan subsequently had his shock victory overturned.